I was on the phone with a coach the other day and she said to me, “wow, I’m just surprised at how much time and effort it takes to get client leads." As beneficial as coaching could be to 90% of people, a relatively small percentage of those people are actually looking for a coach. Unlike plumbing, most people don’t associate their everyday problems (not satisfied at work, communication troubles with spouse, disorganized business) with the services of a coach. Therefore, when you get a lead, you want to do everything you can to turn that lead into a happy, paying customer. 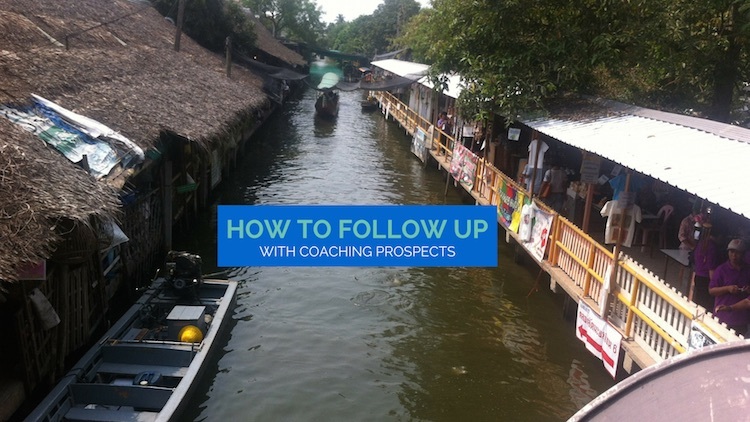 From our years of experience following-up with Noomii leads and learning from the most successful coaches, here is a guide to landing the client. Let’s start with some key principles first. Speed matters. Time and time again, we’ve emphasized the importance of responding to leads quickly. Even if you get a message during the evening or on the weekend, follow-up as soon as you can. That doesn’t mean that you have to be ready to talk to the client for one hour during your family dinner. It means that you should take five minutes to call and schedule an appointment when you’re next available. It demonstrates your level of care and professionalism. In at least one documented case with the Noomii Referral program, two out of three recommended coaches never got a chance to talk to the client because she made up her mind after talking to the first coach. Yes, we want you to close the sale but first and foremost, you need to be thinking about building relationships. Hustle and regularly follow-up but always follow your social sensibilities. Treat the lead as a real person with their own set of concerns, issues, and reservations so try to meet them where they’re at. When a client lead provides a phone number, use it. Don’t wimp out on email, which is so easy for the prospect to ignore or delete. When leaving a voicemail, answering the phone, or writing an email, use your best tone. You don't need to be a cheerleader but don't be depressing either. When responding to leads, don’t go on and on with lengthy messages. Nothing is going to sell coaching better than talking to the client, so say as little as possible to get them on the phone. Often, reaching out once is not enough. You need to be persistent and for most of us, relying on our memory to follow-up is bound to fail. Whether you use a spreadsheet, your calendar, or a full-blown CRM, have a system and use it. The system you use is only as good as your discipline in using it everyday. If you do everything in this post, more prospective clients are going to call you back. You need to be ready. Answer your phone in a professional tone, be organized with your system, and be ready to take on new clients. What do I mean about a hot lead? It’s someone who has reached out to you. Maybe they contacted you on Noomii, they left you a voicemail, or they submitted a response to your website contact form. These are hot leads and you need to follow-up quickly. We recommend following up four times, twice per week for two weeks. Here’s a simple way to do that. Step 1: If you have their phone number, call them to schedule an appointment. If they don’t answer, leave a voicemail (check out the voicemail template below). Step 2: In the voicemail, tell them you are going to follow up with an email or text message. Send them instructions for scheduling an appointment (check out the email template below). Step 3: Schedule your next form of outreach and then, when the time comes, repeat steps 1 and 2. A warm lead is someone who has previously expressed an interest but never became a customer. A warm lead could also be a former client that you would like to stay in contact with. Ideally, in the case of a warm lead, the first thing you want to do is ask for permission to follow-up. For example, let’s say you’re talking to a potential client and they say that while they are interested, they are going to wait three months or so before they evaluate again. If so, ask them if it’s okay for you follow-up in two or three months. I have never once been denied permission. If you are professional and courteous, they will say yes. Get into the habit of it. If you don’t have explicit permission, it’s okay to follow-up anyway, provided you’re not just adding them to your newsletter without permission. On a case-by-case basis, evaluate the relationship and ask yourself what kind of follow-up makes sense. If you went for coffee with a warm lead that didn’t convert, ask them for coffee again in a few weeks or months. If you know their birthday, send them a card in the mail. If you communicate via social media, reach out to them again. The important thing is that you have a system for logging when you are going to contact each of your warm leads and that you actually do it. Remember, by following up, you don’t have to be asking for business or doing a hard sell. Instead, you’re building a relationship with someone over a long period of time so they know and trust you more. Until you have a full roster of paying clients, it is your job to follow-up with leads and establish yourself as a trustworthy person. It’s so important you should schedule blocks of follow-up time in your calendar. With enough time and powerful relationships, prospects will start to come to you. Keeping in mind the above principles, here are some templates that you can use to follow-up with potential clients. The key is that you keep it brief and always aim to get the person on the phone. Cut out the fluff. Here’s a simple script if you are following up with a hot lead. Please note that you should not read this script exactly. Reading will be detectable and off-putting. If you are nervous on the phone, practice, practice, practice. Role play with a friend or practice in front of the mirror. Do whatever it takes to get more proficient. I still get nervous on the phone even though I can ease into my comfort zone in a matter of seconds. You can too. You: Hi Jane, this is Stephan calling from Crazy Accountability coaching. You just requested a consultation through my website. Jane: Oh wow, that was fast. I just sent the request 8 minutes ago. You: Ya, I just happened to have five minutes to follow-up so rather than wait, I thought I’d give you a quick call to arrange an appointment. Do you have a couple minutes to do that? You: I have my calendar open and I have time tomorrow morning. Does that work for you? Jane: No, not really. The afternoon would be much better. You: How does 4pm work for you? Jane: Ya, I can do that. You: Great. I’ll call you tomorrow at 4pm. Is this the best number? You: Would you like me to send you a calendar invite too so you don’t forget? Jane: No, that’s fine. I’ve already put it in my calendar. I won’t forget. You: Talk to you tomorrow. I’m looking forward to it. Hi Jane, this is Stephan calling from Crazy Accountability coaching. Thanks for reaching out via my website. I would love to connect over the phone to discuss how I can help you forge your own unique path. I’ll send you some available times by email. Email me back or call me to schedule an appointment. My phone number is 123-456-7890. Again that’s 123-456-7890. Have a great day. I have two email templates for hot leads. In the first one, I only offer three available time slots (even though I may have hundreds available). In the second one, I link to my online calendar so they can choose a time that works for them. Even though I love my online calendar, I think it’s easier for clients to select between three available slots than to click on a link and use a foreign system. As long as you offer a good variety of options throughout the week (i.e. one in the morning, one during mid day, and one toward the end of the day), most people will slot themselves into one of the available slots. Oh ya, if you noticed in the voicemail script above, I mention that I am going to follow-up by email. If that’s the case, you may want to add a line confirming that. Thanks for the helpful reminders. Great examples! Thanks for the comment Denuelle. So often, the information is not new to us but it's good to be reminded. Was there anything that stood out for you? Excellent information especially for a new coach & business owner. I am definitely in that spot of meeting a lot of individuals who are warm leads but I wasn't sure how to move forward from there! Hopefully this article has mapped it out for you. Good luck! Appreciate the concrete specifics of this. Thanks. You're welcome Susan. Glad you found the content useful. Great reminders and new ideas. Thanks for all the support! Thank you for these brief and meaningful tips.